Terrence Ross is an American professional basketball player who plays in the National Basketball Association (NBA). As of 2019, Ross plays as Small forward/Shooting guard for the Orlando Magic. Previously, he has played for Canadian team Toronto Raptors. The famous NBA star has accumulated a net worth of $25 million. As a small forward/ shooting guard he reportedly earns around $10 million as an annual salary. Ross is married to his longtime girlfriend Matijana, to whom he has two beautiful children; Tristan and Zoey. He shortly dated Amber Rose in 2016. As of 2019, the Athletic forward has an estimated net worth of $25 million. He reportedly earns around $10 million as an annual salary from Orlando Magic. As per reports, Ross has made over $32 million from his NBA career as career earnings. In 2018-19, Ross will earn a base salary of $10.5 million, while carrying a cap hit of $10.5 million and a dead cap value of $10.5 million. He is currently Magic's fifth best-paid player besides, Aaron Gordon, Evan Fournier, Timofey Mozgov, and Nikola Vucevic. Regarding his personal car collection, Ross owns a Luxury SUV Range Rover which costs more than $85,000. He also owns a GT-R Nismo which reportedly costs around $100,000. The famous athletic star has an impressive height of 6 feet 7 inch and a weight of 206 lbs (93kg). The young NBA star is famous for his multiple affairs. During 2013-2016, he dated a former model Matijana, to whom he has two beautiful children. In 2014, their first son Tristan was born. In 2016, Ross shortly dated Amber Rose, a former model. While their relationship couldn't last long, it became the reason for Ross's separation with Matijana. Happy Birthday to my beautiful Wife. Can’t wait to spend every birthday and anniversary with you. Love you baby ???????? However, as per recent Instagram images, it appears that Ross has been back together with Matijana. In 2018, their second baby daughter Zoey was born. Besides an NBA star, Ross is also quite popular is social media. He has more than 194k followers on Twitter and 351k followers on Instagram. Terrence James Elijah Ross was born on February 5, 1991, in Portland, Oregon of United States. His father Terry Ross and mother Marcine Ross were professional basketball players. He grew up along his brother Drew Parker and sister Taelor Ross. Ross attended Jefferson High School, where he played basketball for the high school team and won the Oregon 5A Player of the Year. Later, he was transferred to Montrose Christian School in Rockville, Maryland, where he set 13.5 points and became first-team All-Metro. In 2010, Ross was ranked 5th best small forward and 30th best player in the nation. On April 30, 2010, he signed National Letter of Intent to play college Basketball for the University of Washington. Terrence Ross's professional NBA career began in 2012. He was selected with the 8th overall pick by Toronto Raptors in the 2012 NBA draft. On July 10, 2012, Ross signed a rookie-scale contract with the Raptors. On February 16, 2013, Ross became NBA Slam Dunk Contest champion by defeating Jeremy Evans. In the final round, he received 58% votes from the fans around the world. In his second season, Ross scored a career-high 51 points against the Los Angeles Clippers. He tied the franchise record set by Vince Carter on February 27, 2000. Ross became the first player in NBA history to have a 50-point game while averaging under 10 points per game. On February 14, 2017, Ross was traded to the Orlando Magic in exchange for Serge Ibaka. 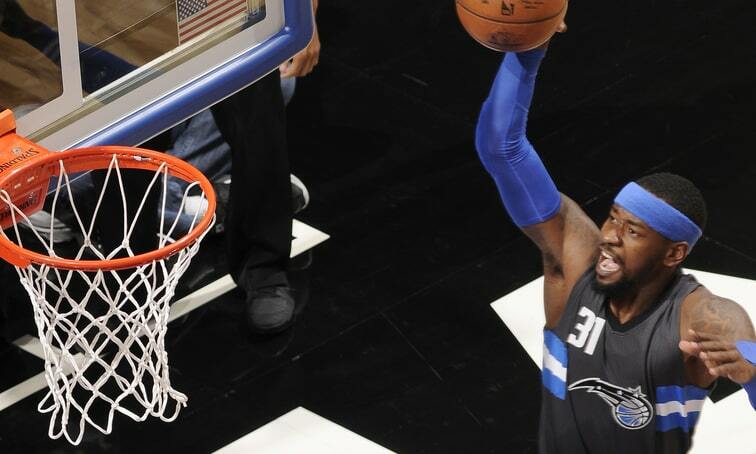 He made his debut for the Magic on February 23, 2017, recording 13 points on four of 17 shooting against the Portland Trail Blazers. On November 22, 2017, Ross scored a season-high 22 points against the Minnesota Timberwolves. On November 30, 2017, he was diagnosed with a sprained right medial collateral ligament (MCL) and a non-displaced fracture of his right tibial plateau. Ross returned to action on April 8, 2018, where he averaged 3 points against the Raptors.